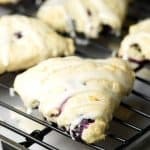 Blueberry Lemon Scones - tender flaky scones with fresh blueberries throughout and a dreamy lemony glaze! In a large mixing bowl, combine flour, baking powder, sugar, salt, and half of the lemon zest. Add butter and cut in with a pastry blender (or your hands) until mixture resembles crumbs. Half n Half is simply equal parts whole milk and heavy cream.